PoPville » A “Temporium” Coming To Mt. Pleasant? + Any Mt. P Specific Food Banks? A “Temporium” Coming To Mt. Pleasant? + Any Mt. P Specific Food Banks? Some folks may recall the Temporium that was on H St, NE this summer. It was very cool. I’m now hearing another may be set up in Mt. Pleasant (though the announcement will come this week). 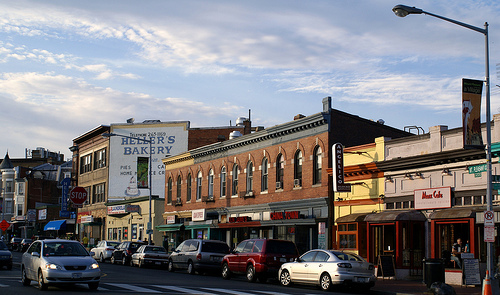 On Wednesday, October 6, 2010, the DC Office of Planning announced funding available through the Temporary Urbanism initiative to establish a Temporium. A Temporium transforms vacant storefronts or spaces into a temporary retail space for local designers to exhibit and sell their work. A Temporium helps meet several objectives established by the District of Columbia through the Creative DC Action Agenda and the Retail Action Roadmap including supporting creative entrepreneurs, activating commercial corridors and highlighting their retail potential, providing residents with unique services and activities, and promoting neighborhoods. The Temporium implemented on the H Street NE corridor in July/August 2010 attracted over 1,600 visitors to H Street NE over four weekends, and generated sales and new opportunities for seventeen participating designers. I think adding one to Mt. Pleasant would be awesome. I hope they are selected for funding – stay tuned! Anyone know of any Mt. P specific food banks?